This week the kids were at home for the Easter holidays, I took them to the park after work, we took them to an adventure park (this one), we let them spend more time than I would have liked on the internet. As the two week holiday wore on, I still heard more and more of “I am bored”. It came to a head towards the end of the holidays. We had planned a trip with my sister in law to a trampoline park and we had kept the Easter Monday holiday free to take them out. After three days of back and forth to the park, I decided on the fourth day that I didn’t fancy the park, it was cold and boring (yes mum’s get bored too kids!). Not to mention it was costing me slushees and ice cream on the trip home every day. The last one felt a bit below the belt and it was enough to push my patience past tipping point. I cancelled the trip they had been looking forward to at the Trampoline Park. I cancelled any other days out. I cancelled all requests for eating out, toys, trips or treats. I did it with glee and a feeling of satisfaction. For once I didn’t feel guilty. It felt like the right thing to do. I was shattered and I could well use the long Easter weekend to rest at home and organise my home. We have finished refurbishing our living room and I have boxes of books, craft materials and things that live at the backs of cupboards to sort out and half the house feels displaced. I wonder if they thought I would stick to my word or soften. My problem is that I love eating out, day trips, doing fun things with them. So often, I end up relenting and doing nice things with them anyway. But in recent times, I feel as if there is a note of entitlement creeping into our relationship. I have always tried to do everything I can to make them happy, give them wonderful memories of their childhood and make sure their needs are adequately met. I have gone out of my way to make sure they have everything they need to do well at school and they know that this is a weakness of mine because I feel as if I missed out on some things as a child. I think that there is a point when trying to do so much good becomes counter-productive. I am coming to realise that sometimes going without things is good for the child. That having to earn something, meet a challenge without hand-holding or even just plain old chores are character building and help the child grow. I read somewhere that teaching a child how to do things for themselves and making them do chores helps them to go into the world as much more of a benefit and blessing to the world, than a useless burden that looks to everyone else to do clean up their mess after them and not serve others in any useful way. My mother-in-law often says that a person who has worked hard as a child is never intimidated by hard work and will confidently roll up their sleeves without a second thought throughout their lives, whenever the need raises. Whereas a child that has been coddled, will always blanch at work of any kind and look to others for help. So I spent the last few days catching up on things I had to do, enjoying reading and basically telling them to entertain themselves because it was not my job and I could not care less if they are going to be rude about it. So we can keep on trying our best, making good intentions and investing our time and energy. But next the kids infuriate me or behave in an entitled way, I won’t feel like a failure, I will use it as a learning opportunity for them and enjoy myself in the process. Good for you sis! I'm sure all parents go through spells like this - it can be such a struggle at times with so many sacrifices. You work so hard to do the best for your kids and did the right thing. I must admit that whining is one thing I will not stand for either! I don't like to be unkind, but you have to draw the line somewhere. I had to laugh out loud when you described your problem of not taking them out when you really enjoy doing so! I have done this in the past and would shoot in my own foot, because I really needed some fresh air and was stuck in the house with a very cranky child that was driving me crazy, but I couldn't leave the house because his punishment was that we wouldn't go outside. It was punishing me just as well ;). Now, I try to make sure to use punishments that don't affect me too much. But it's a work in progress! Good for you for putting your foot down! Something such tough love is exactly what they need and shows them that you love them very much, though they might not recognise it at the time. It is interesting what you say about your son's punishment directly affecting you. 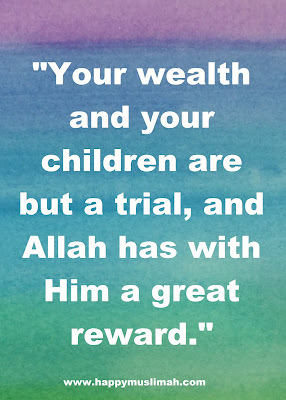 It reminds me of a tip from Islamic parenting class, which was that if we do reach a situation where we have no other option than to take disciplinary action, then it can be beneficial to also impose upon ourselves some kind of extra good deed afterwards, such as a day's sawm or giving zakat, so that we too feel the consequences of the episode. The sawm gives us the inspiration to contemplate our actions, reflect on our own role as parents in the situation and to think about how we might prevent it from recurring, perhaps by turning to Allah Subhanahu wa Ta'alaa more quickly for help in the future. It also reminds us to make good use of the guidance we have been given in the Qur'an and Sunnah, to stay within Sharee'ah limits and not to turn to punishment too quickly. Alhamdulillah I have found that fasting can really help turn a negative event into a positive learning experience. I would never have thought of it in that way, to follow up discipline with a good deed, definitely something for me to reflect on.